In terms of ROI, Facebook ads are one of the best marketing tools out there. But if you’re going to use Facebook’s advertising platform, you have to play by their rules. There are quite a few guidelines governing Facebook ads. They have rules about images, about how much text you’re allowed to use, and even about what kind of wording you can use in your copy. 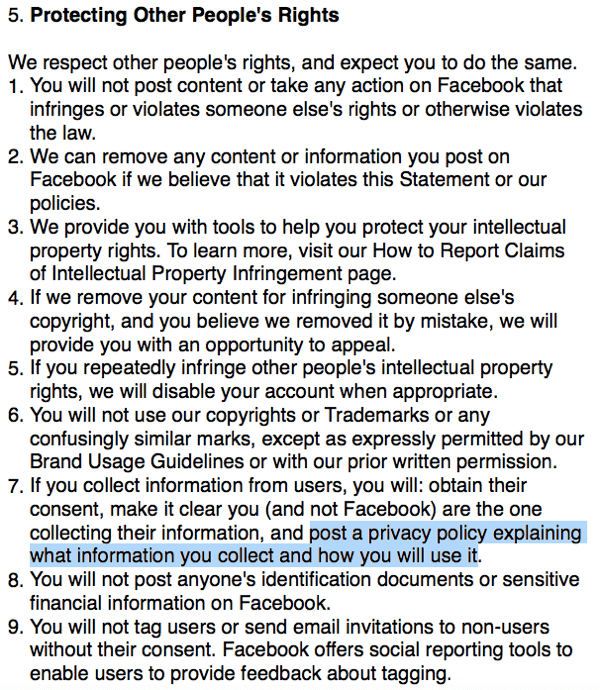 They also have terms of service for Facebook Pages. It’s all too easy to accidentally violate one of their terms. This can be a headache to sort out, and your ads or even your business page can get flagged for manual review — bringing your campaign to a standstill for an undetermined amount of time. This informs users about how their data will and won’t be used. While people generally don’t actually read that sort of thing, it’s something that you need to have. Not to mention that it’s legally required in most countries. It should let users know if you use “cookies” or other tracking signals, and there are some requirements about marketing and collecting personal information from children younger than 13 years old. Most countries have such laws, including the U.S., Canada, and members of the EU. You can learn more about how to stay within Facebook’s guidelines over at Social Media Examiner.